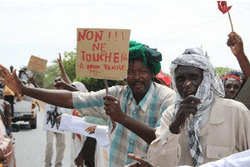 Over nine thousand farmers and pastoralist in St. Louis in the north of Senegal are facing possible evictions from their land as multi-national agro-industries scramble for agricultural land in the region. Speaking to the African Press Agency on Sunday, Fulani cattle herders of the local community in Ross Bethio accused Senhuile â€“ Sénéthanol, an Italian multinational company of encroaching on their grazing and farm lands. They claimed that more than 37 villages are currently deprived of their land thanks to activities by the company which is based in St. Louis. The local population said they have lost over twenty six thousand hectares, leaving them without the means to continue herding cattle and farming their lands. “We prefer to die than to allow our land to be taken away by a foreign company. We shall not succumb to this new form of colonization” said Gorgui Sow, a member of the youth platform in Ndiael local community to fight the “illegal occupation”….